Today, if you drink a beer and it has a strong smokey taste, that’s by design: the brewmaster wanted you to taste that smoke and they went out of their way to introduce it. 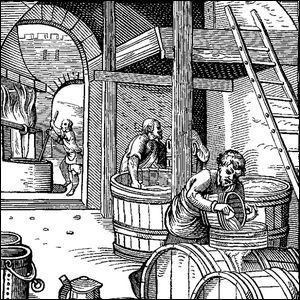 Prior to the advent of the Industrial Revolution, however, the taste of smoke in your beer was just part of the beer experience. Why were the beers of yore smokey like strong Scotch? Part of the beer brewing process (both then and now) is malting. Malting is the process of germinating grains to cause them to sprout and, in the process, release sugars that are critical for the fermentation and brewing process. Once the malting process is started, however, it must be stopped and the grains dried before they begin to rot and mold (mold might be integral to some food production processes, but beer is not one of them). Historically, the only way to accomplish that was to dry the malted grains over a fire and, by natural extension, the malt ended up smoked. The arrival of the Industrial Revolution made it possible, through the use of coal-driven heat exchangers, to apply heat to the malt without bathing the malt in smoke. Today, very few beers around the world (and next to none outside of Norway and Germany) are produced with traditional smoke-dried methods.